Kitchens Are Monkey Business: Rosie Makes Crab Meat Boules. Take a pound of crab meat. And go in two different directions. In my opinion, the best way to eat crab meat is straight out of the crab, dipped in butter, with a squeeze of lemon juice. However, if you want something different and are willing to put forth a little effort, I would recommend my crab meat boule. Basically, it's a hollowed-out round of bread with a crab meat filling that's baked until the bread is toasty and the crab mixture is bubbly. It's great as an appetizer for a party. You can buy one of those big boules in the bread department and fill that with the crab meat, using the torn bread pieces to dip with. Or you could buy those miniature phyllo cups in the frozen section and fill them for individual appetizers. Or you can make your own boules from scratch, which is what I'm showing you how to do. My bread recipe makes enough for 5 boules and 1 loaf. I used 1-cup ramekins for the boules and a 4 x 8-inch pan for the loaf. Pour water into a medium bowl and sprinkle yeast over top, then sugar. Let proof. That means wait for the bubbles and foam so you know that the yeast is alive and working. When the mixture is foamy, stir in the flour and salt. 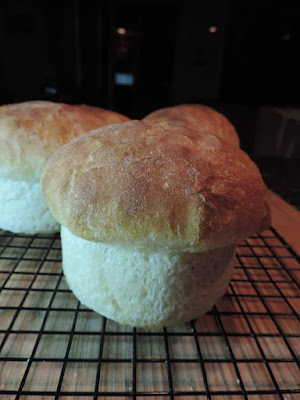 Using the dough hook of a mixer, process until dough comes together in a ball, then turn dough onto a lightly floured surface and knead for a few minutes, adding more flour, if needed. Dough should be elastic and pliable. Of course, you don't need a machine for this. You can be the machine and use your hands to knead the dough. Place dough in an oiled bowl, cover, and let rise. When dough has doubled, punch down and let rise again, until doubled. You can place the dough in your ramekins and loaf pan now, or you can place covered dough in refrigerator and let it spend the night. This is what I did - set it in the fridge. Letting the dough chill overnight allows the gluten to develop along with more flavor. Remove dough from fridge and let come to room temperature. Divide dough into 6 balls - 5 small and equal sized and 1 larger. Place the smaller balls into oiled 1-cup ramekins. Form the larger ball into a loaf shape and place in an oiled 4 x 8-inch loaf pan. Gently brush tops of bread with beaten egg wash.
Bake at 350° for 7 minutes, then rotate and bake another 7 minutes. Cover with foil and continue baking for 10 more minutes. Water, yeast, and sugar. I don't even bother to stir it. Let it get bubbly and foamy. This is called "proofing" the yeast. The yeast has to "prove" it's alive - by eating sugar and producing carbon dioxide and other byproducts. And process, with the dough hook, to bring it all together. You want the dough to pull away from the sides, but still remain slightly attached at the bottom of the bowl. Then put the sticky mass onto a lightly floured work surface. Knead it by hand. It should be soft and elastic. And place in an oiled bowl. You can refrigerate it now, overnight, if you like, or you can form into the boules and loaf. I refrigerated mine. Time was not of the essence for me. Form it into a ball again. Then form into individual boules and a loaf and place in oiled ramekins and a loaf pan. The ramekins are 1-cup; the loaf pan is 4 x 8-inch. Let bread rise, then brush lightly with egg wash.
Now for the crab meat mixture. In a small sauce pan, melt butter, with Brie and cream cheese. Gently fold in crab meat, being careful not to break up crab meat. Add in shallot, red pepper, and lemon juice. Heat through. Stir in sherry. I never thoroughly incorporate the sherry. I like to have "pockets of flavor." Slice tops off each boule. Carefully hollow out the boules, leaving the base intact. Tear the pulled-off bread pieces into bite-sized dunking pieces. Place boules on oven-proof platter and spoon crab mixture into each. Sprinkle tops with a shake of paprika. Arrange torn bread pieces around boules. Bake in 325° oven until bread is toasty. 10-15 minutes. Melt butter with Brie and cream cheeses. Fold in crab meat and lemon juice. Here are the boules, ready for scooping out. And bake until everything is nice and toasty.